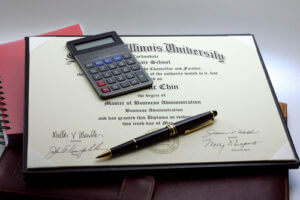 An MBA certificate with a pen and calculator on top of it. Photo courtesy of Shutterstock. 1. Management Analyst: Management analysts are advisors who evaluate a business to give opinions on how to make a better organization, manage more professionally, and increase earnings. And a large number of employers, specifically those related to private sectors, desire to work with forecasters who have obtained an MBA degree.